Find out why quick lube operators have begun to see the trend toward extended drain internals as an opportunity, not an obstacle. Find out why oil change specialists are choosing the AMSOIL 7500-Mile/Six-Month Oil Change Program. With regard to wear protection, fuel economy, and high and low temperature performance, there is no better motor oil on the market than AMSOIL. In 1972, AMSOIL became the world's first fully API sequence tested synthetic motor oil for automotive applications. To this day, AMSOIL product performance is second to none. Even though you recommend 3,000-mile oil change intervals, the truth is that people do not change their oil as frequently as they should. Harsh engine conditions cause petroleum oils to degrade far more quickly than synthetics. You will not need to worry about your customers' vehicles if they stretch their intervals beyond what is recommended and neither will they. AMSOIL synthetic motor oil provides long-term protection. AMSOIL offers warranty coverage for it's products when used as recommended in mechanically sound engines. AMSOIL specializes in manufacturing a wide range of fuel efficient, long life lubricants for all manner of applications. In addition to motor oils, AMSOIL markets synthetic automatic transmission fluid, gear lubes, hydraulic and compressor oils, greases, as well a family of filtration products for every kind of application. The AMSOIL product loine includes excellent fuel additives, biodegradable antifreeze and family of automotive car care products. Ask to see our G-290 product catalog. Our program not only reduces disposal costs, it cuts down the amount of time devoted to managing oil and filter disposal processes. These benefits flow directly to your bottom line. Extending oil drain internals has signigicant environmental benefits, the most obvious being less waste oil and fewer oil filters to dispose of. AMSOIL products are an add-on product line that opens up increased profits without significant risk. Profit-minded operators soon recongnize their earnings protential with AMSOIL synthetic motor oils. AMSOIL products are an ideal match for your business. By offering both your existing products and AMSOIL products, you can satify the full range of customer lubricant needs. Some customers and their vehicles are not candidates for premium systhetic motor oils, and some passenger car owners are concerned only with initial price rather than long term value. For these customers, you'll still want to be sure to have your standard motor oil on hand. With AMSOIL products, however, you can now offer your quality-conscious customers a high quality alternative to their traditional lube service. AMSOIL provides a wide range of suporting promotional activities. "I have customers who come thirty miles to have my shop put AMSOIL in their cars. It's a great indication of people's increased appreciation of synthetics and high quality products." Profits per customer will vary based on prices and overhead calculations. AMSOIL recommends a markup of 2 to 2-1/2 times the normal petroleum-based oil change pricing. * According to major oil company data, the average consumer changes their oil 2.7 times per year. With AMSOIL, two oil changes per year enables you to earn more money than five oil changes, and nearly twice as much as the typical 2.7. As an added benefit, customers’ cars have better protection with AMSOIL XL. Note: The filters you currently use are sufficient for the duration of the complete service interval recommended by the automobile manufacturer. Premium filters are available from AMSOIL if you want to offer them to your customers for an additional charge. Not only do lube shops make more money with the AMSOIL XL-7500 Program, customers save money and experience more convenience with the same program. We encourage you to display this kind of comparison for your customers when asking them if they would prefer coming in 5 times a year for a 3000-mile/3-month oil change or twice a year for a 7500-mile/6-month Premium Oil Change. The answer should be obvious. All numbers based on 15,000 miles per year utilizing typical values extracted from current research. 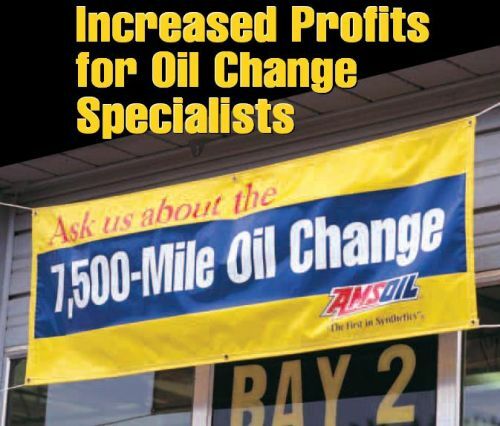 The AMSOIL 7500-Mile/Six-Month Oil Change Program brings value to your customers ...and profits to your bottom line. With the introduction of AMSOIL Synthetic Motor Oils in 1972, there has been a new understanding of the performance possibilities of lubrication technology. Since that time AMSOIL Synthetic Motor Oil has been the best quality motor oil in the world. AMSOIL Synthetic Motor Oils improve fuel economy and engine efficiency. No motor oil on the market provides better high and low temperature protection against wear. AMSOIL synthetics have a much longer service life, hence they will protect engines for the entire duration of the manufacturer’s oil drain recommendations, both normal and severe service, and beyond. * A variety of price models can be used to ensure your profitability. AMSOIL recommends charging two to two and a half times your current service price. Drastic changes in engine design,with their smaller, hotter engine compartments, tighter tolerances and emissions standards have placed higher demands on lubricants. At the same time, vehicle manufacturers are seeking extended drains,cleaner engines,improved fuel economy, reduced oil consumption and better wear protection. One industry analyst has speculated that over time as increasing numbers of baby boomers enter their peak earning years, 90% of all cars on the road will be high performance vehicles. The modern quest for "more, better, faster" has made an impact on every industry. As a result, high technology synthetic motor oils like AMSOIL have found increasing acceptance in every facet of American industry. A major consciousness shift is occuring as Americans become more selective in their purchasing, focusing more on performance over price. The rapid growth in sales of synthetic lubricants is directly related to its superior performance capabilities. Government regulations and rising consumer awareness will continue to drive the push for environmentally friendly improvements in the industry. Extended oil drain capabilities are already being aggressively pursued in Europe, placing greater demands on oil formulators to improve the quality of their products. AMSOIL offers a model program that lube center operators can embrace which is not only environmentally wise, but economically suited for profit-mindedness as well. Click HERE to find out how an oil change center can make more money in 10 seconds! Click HERE to see why you should prefer AMSOIL XL over Mobil1 SuperSyn! Set your Lube Shop apart from the competition. Make your shop THE place to go in your area! Allow a fast lube specialist to help you take your business to the next level.